If you’re finding yourself squinting or looking away at bright lights while driving, you’re not alone. Doctors say more and more people are coming to their offices with concerns about glare — especially when it comes to the newer, brighter LED headlights. 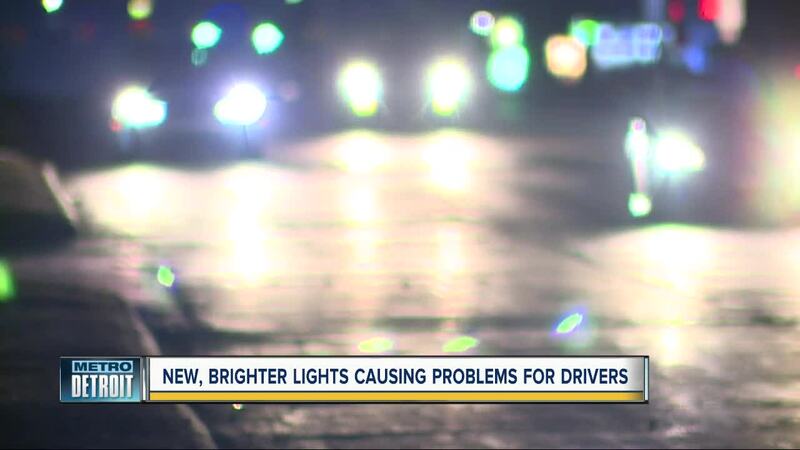 DETROIT (WXYZ) — If you’re finding yourself squinting or looking away at bright lights while driving, you’re not alone. Doctors say more and more people are coming to their offices with concerns about glare — especially when it comes to the newer, brighter LED headlights. Years ago you’d see an occasional bright blue headlight, but more and more car manufacturers are opting to install LED — or in some cases H.I.D (High Intensity Discharge) — to ensure that drivers are safer in low-visibility situations. Experts say it can create irritation. It causes you to want to shy away from it, and so as a result, it can cause a lot of reflexes to kind of close the eye, dim the eye, look away. Artura Flowers said she makes her husband drive most of the time, but when she does drive during the early morning she finds herself shielding her eyes from some drivers. Both Laprell and Flowers noted it’s hard to tell whether someone even has their brights on. Studies show that long exposure to lights can damage the retina, but in the case of bright headlines Dr. Jaber said there’s more irritation than damage. That said, if you’re dealing with regular issues of glare, he said it’s a good time to visit an ophthalmologist to find out whether you have cataracts — or potentially another issue that’s giving you issues. It’s important to note that federal restrictions are in place to limit how bright a headlight can be. However, if you’re forced to look away due to bright lights it can be as dangerous as using a cell phone while driving. According to studies, a car driving 55 mph can drive the length of a football field in just five seconds while someone has their eyes looking away from the road.